Thank you for visiting the Weaver’s Sanitation Service website. Please check back as we add important information for our customers. If you are not yet a customer we invite you to sign up today. Call us 1-800-604-6065 or (814) 735-4589. We offer residential, commercial dumpsters and roll-off service. Our residential and commercial dumpster service areas include Bedford, Fulton and parts of Blair and Franklin counties. Our roll-off service areas include Bedford, Blair, Fulton, Franklin, Somerset, Cambria, Huntingdon, Maryland and West Virginia. 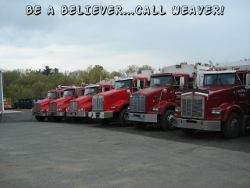 © 2017 - 2019 Weaver's Sanitation Service. All rights reserved. Service Policy | Refund Statement | Privacy Statement Powered by WordPress and Smartline.